PARIS — Anyone who thinks Mario Balotelli is not committed to his new club Nice should watch a replay of Wednesday's 4-0 home win against Monaco, and listen to the fans chanting his name when he came off late in the second half after scoring twice. The Italian striker has scored four goals in two league games since joining on a free transfer after an unhappy spell in England with Liverpool. "La-la-la-la-la-la-la, Su-per Ma-rio" the Nice fans at the Allianz Riviera sang over and over when he was taken off 12 minutes from the end. As well as being involved in a physical altercation with Monaco defender Jemerson, squaring up to the Brazilian defender in the first half, he worked hard for his teammates. They have clearly taken to the controversial player once tipped for greatness after breaking into the Inter Milan side as a lightning-quick 17-year-old. "He must keep going like this, he'll get back to the highest level if he stays professional in every way," Nice coach Lucien Favre said. "After many difficult years, the way he recovers (physically) is going to be decisive in getting back to the top. Step by step, we will help him." He was mobbed after both of his goals, the first an excellent solo effort, the second a clinical finish. So much for the Balotelli criticized for being lazy in training by former Liverpool manager Brendan Rodgers. 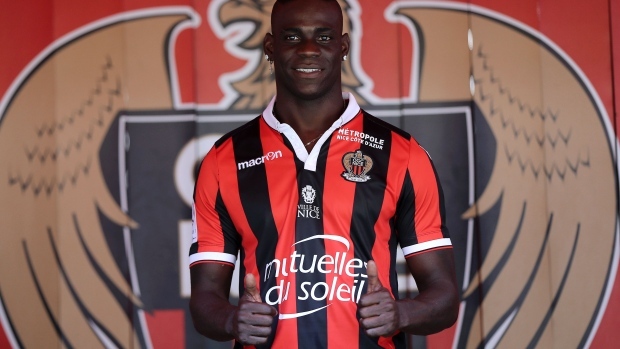 Liverpool's former stalwart defender Jamie Carragher openly mocked his move to Nice, saying on Twitter that even a free transfer was paying "over the odds" for Balotelli. Yet he has galvanized Nice, which sits top of the league, one point ahead of Paris Saint-Germain and Monaco. Ten days ago, Balotelli scored with a first-half penalty and with a late header in a 3-2 win against Marseille. His first goal was much more special this time. Midfielder Younes Belhanda picked him out in the 30th minute with a raking 40-meter pass across the field to where Balotelli was making a surging run down the right. He controlled it on his thigh, knocked it into his stride with the next touch, surged away from Jemerson. He then drew goalkeeper Danijel Subasic toward him before slotting the ball into the opposite corner. Midway through the second half, he latched onto a pass from defender Ricardo Pereira and calmly steered the ball past Subasic as if shooting in training. Cool finishing, for a player ridiculed for having scored only two league goals in the past two seasons combined. Captain Paul Baysse and forward Alassane Plea scored the other goals. Balotelli's career has been punctuated by antics such as letting off fireworks at his home when he played for Manchester City. He still hopes to win his place back for Italy — more than four years after scoring both in a 2-1 victory over Germany in the 2012 European Championship semifinals. Lyon midfielder Corentin Tolisso had an argument with Montpellier goalkeper Geoffrey Jourdren at halftime and smashed a goal past him from 25 metres in the second half. Montpellier led early on through midfielder Morgan Sanson but crumbled after defender Morgan Poaty was red-carded for a lunge on Tolisso. As Tolisso was doing a halftime television interview, Jourdren butted in. "You're injured?" he asked sarcastically as Tolisso was speaking. "Show me your injury, then." Tolisso walked off toward the players' tunnel, with Jourdren talking in his ear. Having scored a first-half header, Tolisso blasted a superb angled shot past Jourdren to put Lyon 4-1 up. Nabil Fekir also scored twice, his first Lyon goals since scoring a hat trick against Caen on Aug. 29 last year. Forward Maxwell Cornet completed the scoring. After blowing a 2-1 lead away to Nice 10 days ago, the same happened again to Marseille. Poland forward Kamil Grosicki scored a penalty in the 86th minute for Rennes and midfielder Adrien Hunou netted the winner two minutes later. Striker Bafetimbi Gomis scored both goals for the visitors, taking his tally to four in six games since joining from Swansea. Striker Giovanni So had put Rennes ahead late in the first half. Bordeaux is up to fourth place thanks to an effective strike trio. Brazilian teenager Malcom, Gaetan Laborde and Sweden's Isaac Kiese Thelin all netted. Guingamp moved up to sixth after forward Jimmy Briand's penalty earned a 1-0 win against Lorient in the Brittany derby. Meanwhile, 10-man Saint-Etienne drew 0-0 away to Nantes, with goalkeeper Stephane Ruffier saving a penalty from Nantes striker Emiliano Sala. Mid-table Angers beat Caen 2-1 while Nancy moved out of the relegation zone with a 0-0 draw at Bastia. Defending champion Paris Saint-Germain beat Dijon 3-0 on Tuesday.